Death is no more than passing from one room into another. But there's a difference for me, you know. 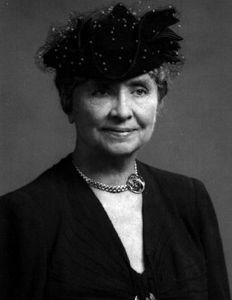 Below are more quotes by Helen Keller. Face your problems and acknowledge them, but do not let them master you. The richness of the human experience would lose something of rewarding joy if there were no limitations to overcome. Have you ever been at sea in a dense fog, when it seemed as if a tangible white darkness shut you in and the great ship, tense and anxious, groped her way toward the shore with plummet and sounding-line, and you waited with beating heart for something to happen? I was like that ship before my education began, only I was without compass or sounding line, and no way of knowing how near the harbor was. 'Light! Give me light!' was the wordless cry of my soul, and the light of love shone on me in that very hour.